MANNY Pacquiao's stint as player of Kia Picanto ended last month when his contract with the team finally expired. 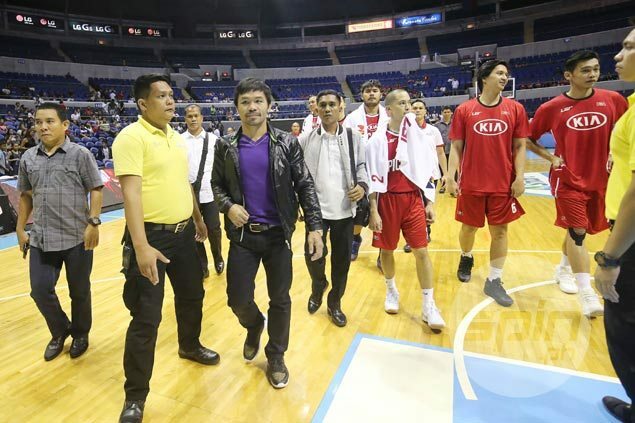 A few weeks after, Pacquiao, the coach followed suit. The 38-year-old Senator and boxing legend formally ended his tie-up with the franchise that made him its first ever first round pick in history as Pacquiao formally bid goodbye to the team on Thursday, SPIN.ph learned from a person very close to the former world champion. The Picanto will play its final game of the PBA season on Friday against the Star Hotshots at the Mall of Asia Arena and it’s unclear if Pacquiao would show up in what could be his final appearance with the team that has fallen further from the depths after a promising start when it first entered the league in 2014 as one of two expansion franchises. Kia has yet to win in 10 games in the season-ending Governors Cup as it fails to make the playoffs for the third straight time this conference. Pacquiao hasn't play a single game this season and appeared in just a couple of games sitting over at the KIA bench as he let lead deputy Chris Gavina to call the shots. Apparently, the boxing great wasn't happy with the offseason trades made by the franchise that broke the core of the team that reached as far as the quarterfinals of last year's Governors Cup. The team let go of Aldrech Ramos, Bradwyn Guinto, Paolo Taha, KG Canaleta, and later on, Alex Mallari. Sy didn't deny anything, adding his offer to Pacquiao to join his ballclub still stands to this day. The Blackwater owner said the eight-time world champion is welcome to come on board to the Elite in any capacity, even as a coach in the same set-up he had with Kia. Leo Isaac is currently calling the shots for the Elite, but is happy to work side-by-side on the bench with Pacquiao, whose work is more of a 'titular head,' according to Sy.